The 2018/19 Greenock Glenpark Harriers got off to a flying start yesterday on the Esplanade. The traditional 4k season opener was once again very well attended with 52 Harriers tackling the short course. Ultimately, it was one of the most dramatic starts to a season you’ll ever see! A strong westerly wind meant that the runners had to judge the pace in the first half of the race, which takes them westbound along the Esplanade towards the Battery Park. After turning in the park, the runners got the benefit of the wind behind them for the sprint back to the finish line. Entering the Battery Park, the men’s race was extremely tight. With defending senior champion Chris Mooney leading a pack of 6 which included last year’s winner Steven Campbell and junior champion Harry McGill. As the leaders approached the Esplanade, Chris and Harry had broken free from the pack and prepared for a sprint finish. Young Harry had paced with Chris the whole way, and with 400m to go he made a dash for the line and took his first senior race win at only 15 years old. 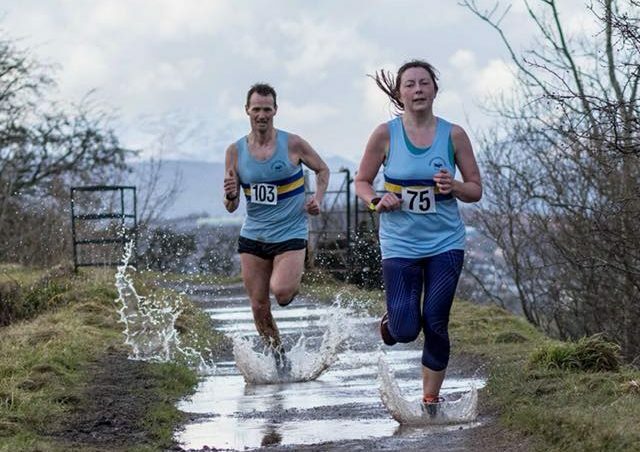 Sandra Campbell is entering her second season as a Harrier, having shown some form in the tail end of last season, she lead the ladies race going into the half way stage. However, not to be outdone by her older brother, Ruby McGill was hot on her tails. Coming out of the Battery Park, Ruby grabbed the lead an was able to hold on for a sensational victory! This marks the first time in club history that both senior race titles have been taken by junior athletes on the same day. And they’ve done it with a combined age of 28… Hopefully there are the first titles in a successful season for both. The senior men’s race was littered with great performing juniors. Another 2 managed to get into the top ten with great runs from Alan Mollins and Ryan Brown. Last years winner Steven Campbell was knocked into 5th place this year, even though he ran just about the same time. However it was good enough for first v40 by just edging out Andy White. It was good to see former club champion Shaun Lyon return to racing with his third place finish, and Daniel Doherty shaved a good chunk off of last years time to take 4th. Stephen Hanley sneaked into the top 10 with a course PB from him of just under the 15 minute mark, just edging out Paul Beaton. Ewan Ferguson narrowly missed out on a top 10 finish, but it was another good run from one of the clubs juniors. He finished ahead of a large pack of seniors that included the returning Andy McCall and a great run from George McCallum. Richard Davidson took the v50 prize by just edging out Danny McLaughlin and Graham McGrattan (first v60). Other junior males included Jude Dolan and Cameron Patton who had great races as well. Elsewhere in the men’s race there was a first outing in a harriers vest for David Black. The parkrun regular recently joined the club with his wife Sharon who was also running in the race. Sandra Campbell’s runner up finish was a 30 second PB from last years race. Claire Monaghan was not far behind in third place as she continues her good form. The ladies race also included a host of juniors who acquitted themselves well, with Abbie Tosh being the fastest behind Ruby in just under the 20 minute mark. The race was sponsored by the Dolan family, and we wish to extend a huge thank you to them for their generosity and help on the day. Also, a big thank you to the whole host of volunteers who made the event run smoothly. This entry was posted in Uncategorized on September 24, 2018 by greenockglenparkharriers.